Harrods launches world’s most expensive perfume priced at more than 173.700 Euro ($220,000)! 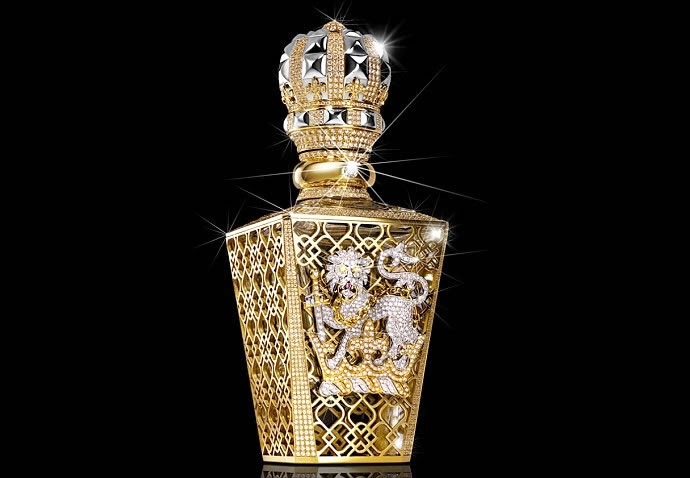 The bottle features the signature crown shaped top -which was an homage to Queen Victoria- in a diamond studded avatar and boasts a lion motif that includes two yellow diamonds and a rare pink diamond. The gold lattice work is all handcrafted and the bottle features a total of 2,000 flawless, individually set diamonds. While we’re reasonably floored by Harrods’ Gilt trip, we wish they had given us a swoon worthy perfume too! We may not judge books by their cover but we certainly judge perfumes by their bottles and to know that this Midas-touched marvel contains the standard 570 Euro (£450-$720) No. 1 perfume is a tad disappointing. We’re not sure if an iconic bottle is enough to make us part with two hundred thousand dollars!